Interestingly, there are certain programs under biotechnology that many consider a misuse. Processes like human cloning or embryonic stem cell research have come under constant scrutiny. Yes, movies make human cloning look cool, but there is a lot involved in it and many people consider it unethical. There are many top colleges across the globe which offers this course. Below is a comprehensive table of the best countries and colleges along with the study duration and annual fees for your consideration. With its prominent Biotechnology hubs in Hyderabad, Bangalore and Mumbai, India is a good option for biotechnology related courses. The Universities and colleges like, All India Institute of Medical Sciences (AIIMS) and IITs (Delhi, Chennai & Kharagpur) offer B. Tech & M. Tech in Biotechnology and are for duration of 4 to 5 ½ years. Admission to the courses in any of these prestigious universities is through an entrance exam. 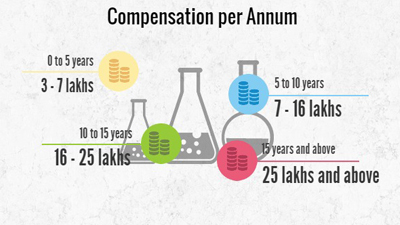 The fee for both undergraduate and post graduate courses in biotechnology is around Rs. 50,000 per annum. There are numerous opportunities that come with biotechnology. Being an interdisciplinary science it is gaining a lot of significance as a profession, thus opening up many avenues for youngsters who want to explore new developments in science. A salary ranging in between 3.5 lakh and 4 lakh per annum is offered in the Intellectual Property Rights Division, where one begins one’s career as a research associate. One will be able to command a remuneration of 3 lakh per annum as a research scientist in the research and development department. Upcoming and constantly growing field and has opportunities worldwide. Does not restrict you to a particular job or an industry. You will have to put in a lot of hard work which can be frustrating at times. You cannot make a fast buck in this profession. Success can be a slow and a tedious process.